a gifts for the desk or dressing table, their dependable accuracy always acts as a pleasing reminder of the giver's good judgment and artistic taste. THE most accurate, reliable and convenient desk timepiece ever manufactured. It has two mainsprings and runs Eight Days with one winding. Casings of genuine leather in various colors and finish, availavle in Square-Cut-Corner -- Taper-- Cushion and Barrel. Dials, Gilt or Silver, Plain or Luminous, Silver Rayed or Two-Tone Silver Rayed and Butler. 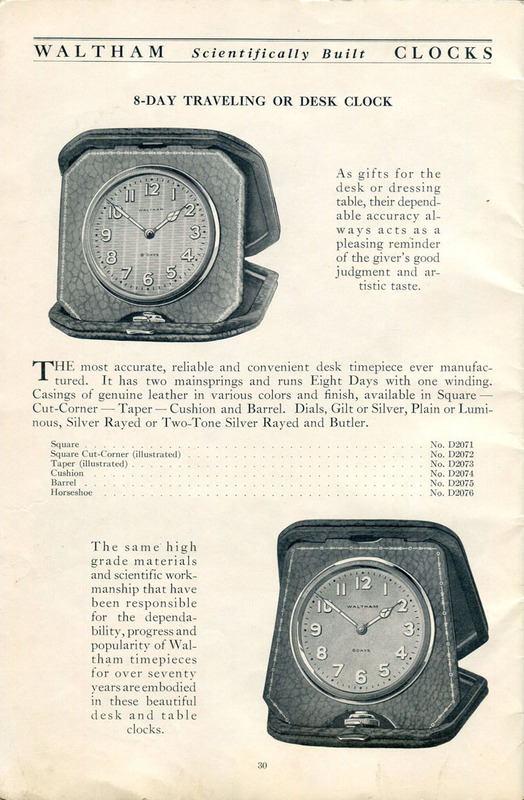 The same highgrade materials and scientific workmanship that have been responsible for the dependability, progress and popularity of Waltham timepieces for over seventy years are embodied in these beautiful desk and table clocks.